Our all new and unique personalised wooden bookstand.Ever had a day in the kitchen where nothing goes to plan?A cookbook is something you often need beside you when following a recipe, preparing food or baking. Having used a traditional cookery bookstand for years, I have found the design to be flawed. Some bookstands are either too bulky and take up too much on your valuable counter top space, or unsteady and only work with small or light recipe books. Once the book of your choice is in position, the spine has to be squeezed open to keep it in the right place or the pages have to be held in place by a wooden peg or the use of metal pressure clips or weighted strings that cover up the wording and can damage the book. For a long time we have been asked to create a good quality personalised wooden cookery bookstand by customers, because they haven't been able to find anything they like on the market. Frustratingly, we have had to decline, simply because we couldn't come up with anything that we felt worked well enough and had no restrictions. Many years of designing and planning, that eureka moment happened! This is our new and unique design, a sturdy and durable, yet slender personalised wooden bookstand that will easily accommodate either paperback or hardback books, half or full-page cookbooks or anything else in your cookbook collection, no matter if it is a new or very old and beloved recipe book. 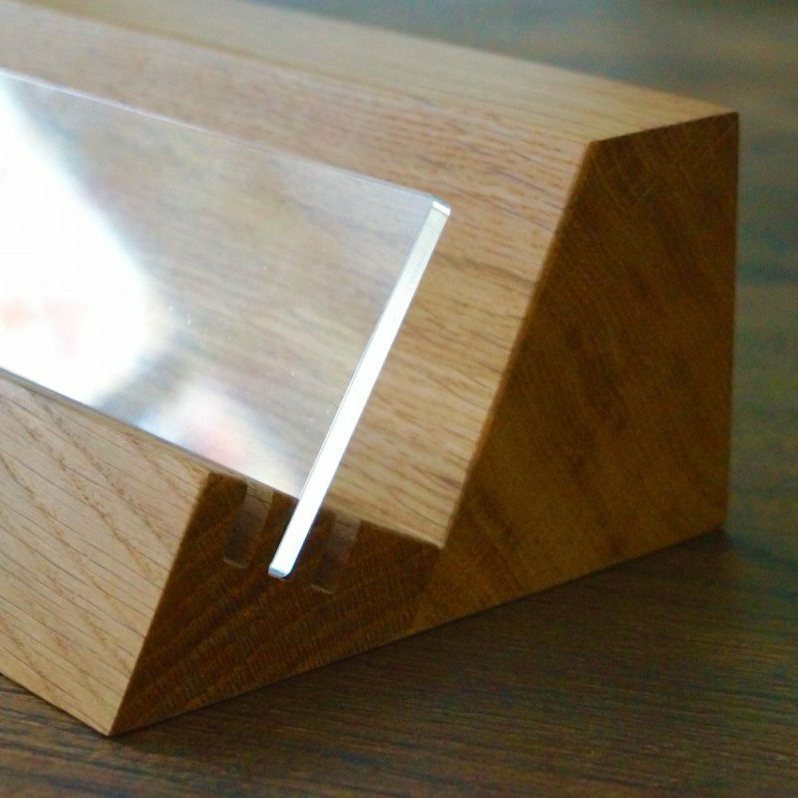 Handcrafted from locally sourced English Oak, our bookstands are of the finest quality.Featuring a perfectly shaped book holder this elegant bookstand will position your cookbook at just the right angel and will be held in place by a perspex page guard, no matter what page you want. And the best thing is, you can read every word from top to bottom. 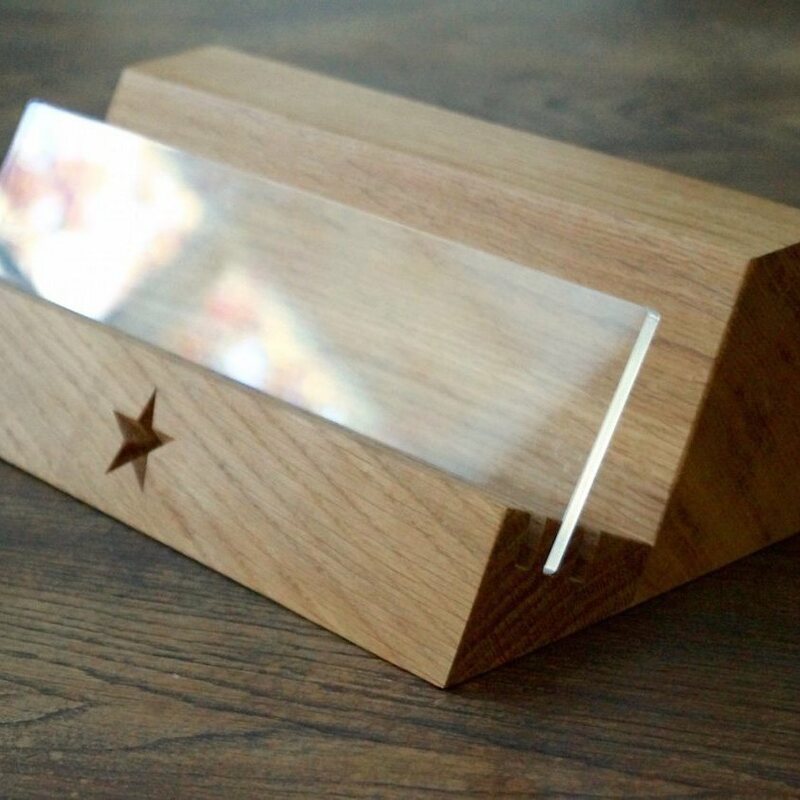 If you are looking for the perfect gift for that special person who loves to cook or bake, this beautiful personalised oak recipe bookstand is absolutely stunning in every way. Personalisation: Our beautiful solid oak bookstands are available blank or personalised with words or letters of your choice. Up to 20 characters on the front face. You can also add carved hearts, stars and other engraved motifs like zodiac signs. Take a look at the options available to you - Engraving options.We can also engrave a secret or personal message for you on the underside of your bookstand, making it that little bit extra special and unique to you. Something like a reading from your wedding day, a favourite poem or quote, something witty, your family favourite recipe or just something thats a secret and you don’t want anyone else to see – but you know it’s there. Please Note: All engravings are in capitals unless otherwise stated. For lower case lettering, this will need to be requested at point of order. All sizes are approximate. Our personalised wooden bookstand comes with perspex splash guard. Thank you, Service was great, kept me updated all the way. Service was great, kept me updated all the way. The board is outstanding and looks great in the Kitchen. Service is superb especially having pulled out all the stops to make a Christmas delivery with me having given very little notice. I purchased a James Martin Chopping Board. Item was better than described. I Big THANK YOU for making my wife’s Christmas !!! Great service and a fabulous product - thank you! Item looks lovely, but sizing really difficult to comprehend. Item looks lovely, but sizing really difficult to comprehend. I ordered the medium at an extra £30 but it looks like I’ve hardly made an effort whereas I’ve actually spent a lot of money. I was dissapointed with the fact the item did not actually have the word salt on it! Considering the price of the product I feel it was a let down! Fabulous item, and excellent, swift delivery, beautifully packaged. Thank you!! Omg this chopping board is just like I have not seen before I love love it if you thinking of treating yourself just go ahead.